Pure end and intermediate members of the irarsite-hollingworthite solid-solution series occur in the Shetland ophiolite complex. Hollingworthite frequently rims irarsite. 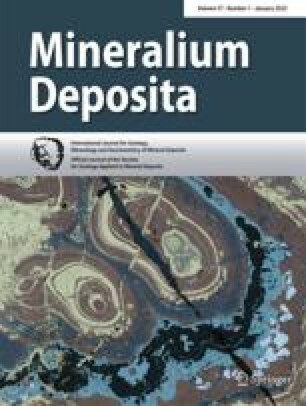 Their compositions are unusually Pt poor, compared with analyses of these minerals from elswhere, suggesting the existence of a Pt-poor environment during their formation. Ir-Sb-S and Rh-Sb-S have been identified as inclusions within irarsite. Ir-Sb-S and Rh-Sb-S together with Rh-Ni-Sb are thought to be new platinum-group minerals (PGM's) in ophiolite complexes. Two types of laurite are present. An Os-rich (up to 22% Os) variety is entirely enclosed by chromite, whereas an Os-free variety is located in the silicate matrix interstitial to the chromite. Laurites in the rims of chromite grains are Os-free but contain tiny inclusions of native osmium. It is suggested that either the availability of Os decreased during crystallisation of the laurites or that Os has been removed from laurites not totally enclosed by chromite. In a few cases laurite is surrounded by a ruthenian pentlandite containing up to 12% Ru.